"The Silver Gryphon" of which these 3 books are part of a even larger series. 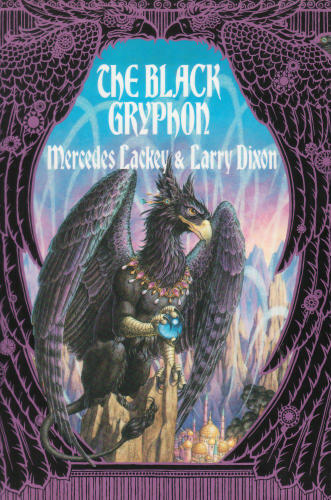 The Black Griffin is a good read, it pulls you in right from the start. Setting a story in prehistory suggests a enormous potential, a feeling that all is new and possible. Lackey's latest created world (illustrated by husband Dixon) predates the setting of her Valdemar series by a millennium but never quite lives up to its expanded possibilities. The gryphon of the title is the charismatic Skandranon, leader of the gryphons, a race of birds just evolving into awareness. After establishing this intriguing premise, however, the tale soon bogs down in fantasy cliches as the main characters fight a standard war against the forces of evil. Although some of the novel's elements, like Skandranon's human friend Amberdrake, suggest a possible complexity, the plot is predictable and the overwritten battle scenes are difficult to follow. In the end, the evil Mage of Black Fire is destroyed, nearly everyone else lives and the chaotic magic of prehistory is tamed. I highly suggest this book.